Malaysia has significant nesting populations, especially the green and hawksbill turtles. Within the Semporna district in the state of Sabah, turtles can be found nesting and foraging. Seeing the importance of these populations in the district, turtle conservation efforts are being carried out by various agencies and organisations including WW-Malaysia. 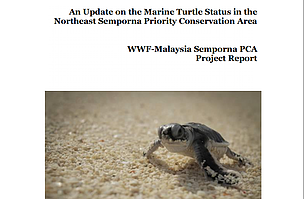 This technical report will provide the result of the habitats assessment and an update of the status of marine turtles in the northeast islands of Semporna Priority Conservation Area which will be beneficial for management of the species and the habitats involved.